Until last spring, everyone wanted to see the new European Copyright Directive pass; then German MEP Axel Voss took over as rapporteur and revived the most extreme, controversial versions of two proposals that had been sidelined long before as the Directive had progressed towards completion. After all, this is the first refresh on EU copyright since 2001, and so the Directive is mostly a laundry list of overdue, uncontroversial technical tweaks with many stakeholders; the last thing anyone wanted was a spoiler in the midst. Anyone, that is, except for German newspaper families (who loved Article 11, who could charge Big Tech for the privilege of sending readers to their sites) and the largest record labels (who had long dreamed of Article 13, which would force the platforms to implement filters to check everything users posted, and block anything that resembled a known copyrighted work, or anything someone claimed was a known copyrighted work). Maybe it's time we stopped holding the future of European copyright to ransom for the sake of a few recording companies. These were the clauses that Voss reinserted, and in so doing, triggered a firestorm of opposition to the Directive from all sides: more than four million Europeans publicly opposed it, along with leading copyright and technical experts—and also the notional beneficiaries of the rules, from journalists to the largest movie studios, TV channels and sports leagues in Europe. Voss has found himself increasingly isolated in his defense of the Directive, just him and the record labels against the rest of the world. And now it's just Voss. The record labels have joined the movie studios in denouncing the working version of Article 13, and calling for the impossible: a rollback of the tiny, largely ornamental changes made in order to give the Directive a hope of passing (they were complaining about Monday's version of the Directive, but the version that leaked yesterday doesn't fix any of their problems). The record labels are willing to risk the whole thing going down in flames rather than tolerate the symbolic gestures to compromise that have been gently draped over the spiderwebbing of cracks in the Directive. Now that Article 13 has not a single friend in the world, save for a single, lonely German MEP, maybe it's time we stopped holding the future of European copyright to ransom for the sake of a few recording companies who are willing to sacrifice the free expression of 500,000,000 Europeans to eke out a few more points of profit. 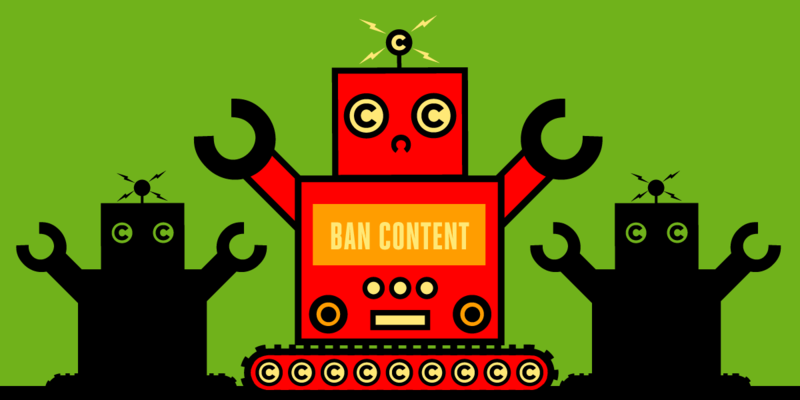 With the national governments and EU going into what is meant to be their final meeting on Monday, now is the time for Europeans to contact their national governments and tell them to stand firm and reject Article 13, lest it bring down the whole Copyright Directive.